01) (This page) Heaven and Tower (Pale version). In my imagination/vision the background was almost non-existent. This pale version tries to show that. 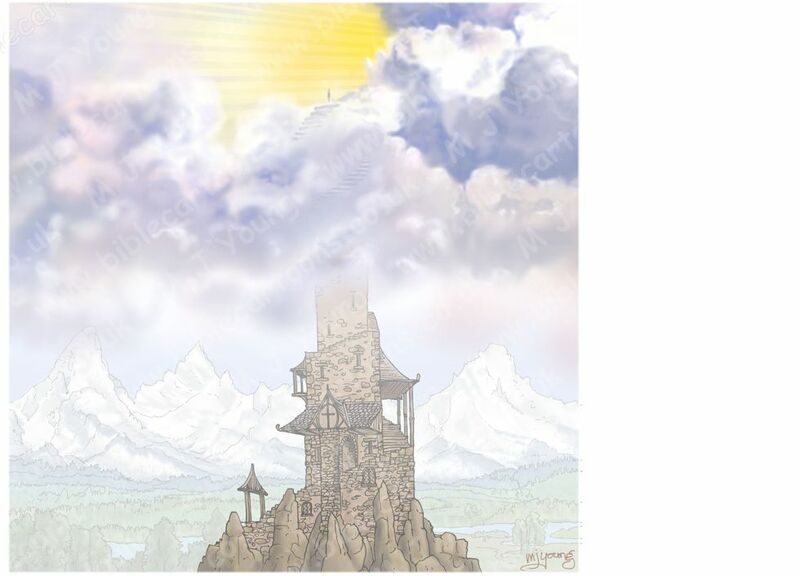 02) (Next page) Heaven and Tower (Colour version). This version shows more of the colour in the picture, which is a departure from what I “saw” in my imagination/vision. These two pictures are my attempt to show what I saw recently in my imagination. I normally draw landscape orientated scenes (rather than portrait orientation), but unusually this scene is square, in order to get everything in! So that the picture will be the same size as every other picture on this website, I have added a strip of white to the right hand side, that’s why it looks offset to the left hand side of the screen. NOTE: The file you could purchase & download is square, WITHOUT the white strip down the right hand side. 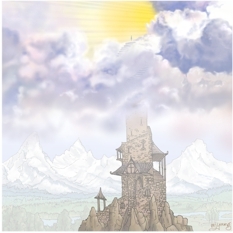 Blog Article: Tower and Heaven imagination/vision story – Is this from God?! Sermon/teaching theme suggestions: These pictures could be used to talk about the concept of keeping our eyes firmly fixed on Jesus from Hebrews 12:1-2.